They also sell a filler pice for that area if wanted. They make them, just don't sell them. Yeah. I don't know why they decided against it. I'd consider buying them if the lowers were available. I assume they make them for customer builds because I have seen a couple rigs with them installed. Yeah I really like the doors, but also like the idea of closing off the bottom of wanted. Do it right the 1st time! Great looking doors! Very nice lines. As much as I like the styling I would need the fillers also or else i would have stuff scattered all along the trail. Is there any added ventilation from the cuts at road speed? Not sure about any added ventilation. My wife said she like it better with these half doors compared to no doors because they block some of the wind. What was the deal with the cheap mirrors? Why didnt they fit? Doors look great color matched! Those two tabs on the back side that are internally threaded are too close together so the mirrors won't set flush to the door. 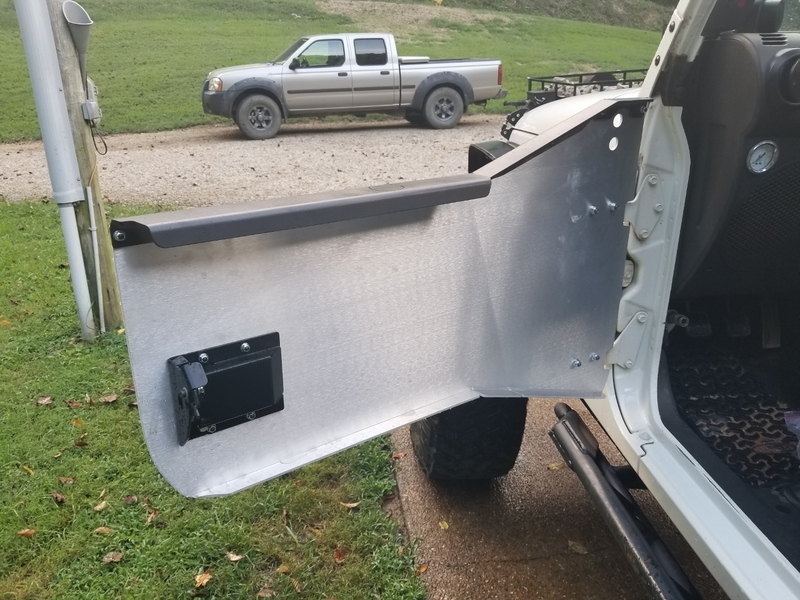 Ground them down to get them to fit and now one of them is too long to work with the brackets that EVO provides to mount the mirrors. I'm gonna buy a set of OEM mirors and try to use the brackets BESTOP makes for use with their tube doors. Looks that will work but not sure. And here's a pic of the inside. I thought I posted it in my first post. I'll spray them with plastidip eventually so they are black.